President Francois Hollande of France has given details of the country’s nuclear arsenal and said maintaining it was necessary in a world that is becoming increasingly dangerous. "The international context does not allow for any weakness... the era of nuclear deterrence is therefore not over," Hollande said during a trip to an air base in the southern city of Istres on Thursday. The Istres-Le Tubé base is home to a detachment of nuclear-capable Mirage 2000N fighter-bombers. "In a dangerous world – and it is dangerous – France does not want to let down its guard," the president said as cited by AFP. "The possibility of future state conflicts concerning us directly or indirectly cannot be excluded." 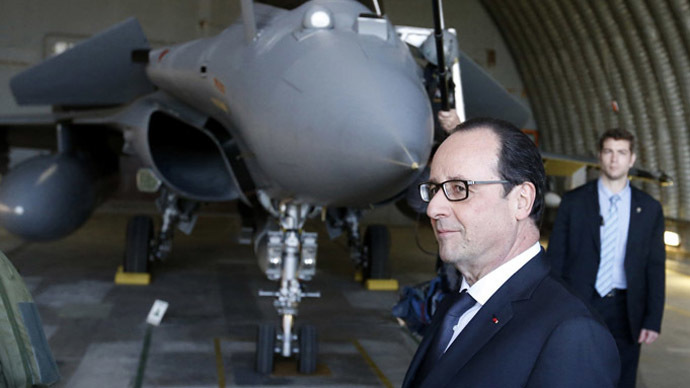 Hollande went on to reveal for the first time the make-up of France’s current nuclear arsenal. He said Paris had "less than 300" nuclear warheads at its disposals. Some of them are carried by 54 ASMP missiles; the medium-range air-to-surface cruise missiles that French military doctrine says can be used as a last resort before a full-scale nuclear war. The rest compose the three sets of 16 submarine-launched ballistic missiles, the M45 and M51. France began developing nuclear weapons in the 1950s as President de Gaulle sought a capability to withstand Soviet Union independently from NATO. In line with this France conducted a nuclear program without help from Washington, although Americans later helped France improve its designs. The country used to have land-based nuclear weapons in addition to sea and air components, but they were scrapped in the 1990s. France was the fourth country to achieve nuclear capability after the US, Soviet Union and Britain. China, India, Pakistan and North Korea have since became nuclear nations while Israel is widely believed to have a nuclear arsenal but never officially admitted it. Hollande’s nuclear stance was criticized by the French branch of the International Campaign to Abolish Nuclear Weapons (ICAN). "This speech, instead of going in the direction of easing international tensions, contributes to creating the conditions for a less secure world," it said in a statement.